Matlab’s Command Window text is notorious for its boring black & white appearance when sending output via the built-in fprintf or disp commands. 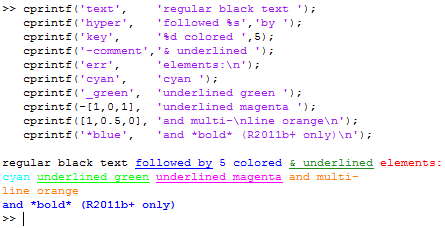 Back in 2009, I explained the undocumented ability to display red or hyperlinked text using fprintf, or colored and underlined text using my cprintf utility. I followed this up last year with the relatively new ability to display bold text formatting, using either fprintf or cprintf. The \b hack relies on the fact that \b is actually the standard back-space control-character (BS, or ASCII 8), which erases the preceding [ (bracket) character. Matlab’s implementation of fprintf simply has a back-door that switches to orange color when it sees a [\b – ]\b couple. By the way, it won’t work if you use any other combination, or if there are not exactly two such in the displayed text. MathWorks made the hack very specific so that it would be close to impossible to come by it by mistake. The [\b sequence is reminiscent of the CSI ANSI sequence used in days of yore, on non-graphic consoles. In those old days, we used the ESC-[ sequence to add text formatting to the console text. Perhaps some MathWorker was nostalgic. Note the related FEX utility tcprintf, which implements ANSI sequences for color-coding the Matlab console output. Do you know of any additional undocumented Command Window hack? If so, please do leave a comment below. Can we get colours while publishing to pdf/html? Unfortunately, it seems that this is another case of hard-coded syntax trapping, which means that it doesn’t respond to other HTML tricks. Anyway, have fun with this! PS. thanks a million for this blog; It has helped me out on many occasions! I’m glad I can make this little contribution. Yet another hard-coded hack. Of course all the regular CSS attributes like color or whatever don’t seem to work. Why couldn’t MathWorks stay consistent?! this is really beyond my understanding. I hope this hard coded hack will work out properly. Here (https://i.imgsafe.org/ebccebb279.png) is what I see in “-nodesktop” mode in R2015b. Tabs are handled properly while back-spaces can not erase text printed by previous fprintf command and produce weird results. Do you have any ideas how to send “\b” character properly to the command window in “-nodesktop” mode? @Andriy – When you run Matlab with -desktop, you see a native (not Java) command window console, and this console does not interpret the \b as a valid control character. \t is much more widely accepted than \b, so this is not surprising. I think it’s also not recognized in Windows DOS consoles. If you want to use a lightweight Matlab console, this naturally has a much more limited feature set.